South Germany's all time thrashers are back with a new opus. They just stay true to themselves and bring back the good old stuff that has made them famous in the mid' 80's. 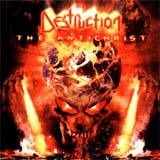 Destruction is back with a masterpiece of thrash like I haven't heard since a long time. This album is even better than the one before All Hell Breaks Loose. The Antichrist really leaves a trail of destruction... I hope there's gonna be lot more bands influenced by them alike Raise Hell with Not Dead Yet!!!!!! It is a blasphemy but lets say it The Antichrist is just... divine ;-).